Duncan Murphy speaking on the steps of the U.S. Capitol during the Veterans Fast for Life in Central America, 1986. Photo by Bill Becker. Successful social change hinges on many factors: strategic thinking, creative action, serious training, critical mass and the capricious accidents of history. But transforming society requires more than applying the tenets of organizing or the vagaries of big picture probabilities. It is a thoroughly human process that ultimately turns on the gumption of people and their intangible power. Dramatic movements can inspire and spur us to action, but we are also deeply nourished by examples of ordinary human beings whose relentless determination so often lies at the heart of social transformation. If they can do this, we find ourselves saying, why can’t I? Those of us who long to change the world would do well to enroll in an ongoing course we could call “Lives for Nonviolent Change 101.” In this class we could study — and be vicariously mentored by — a series of characters whose lives illuminate the qualities and values that the long-distance run for social change requires. 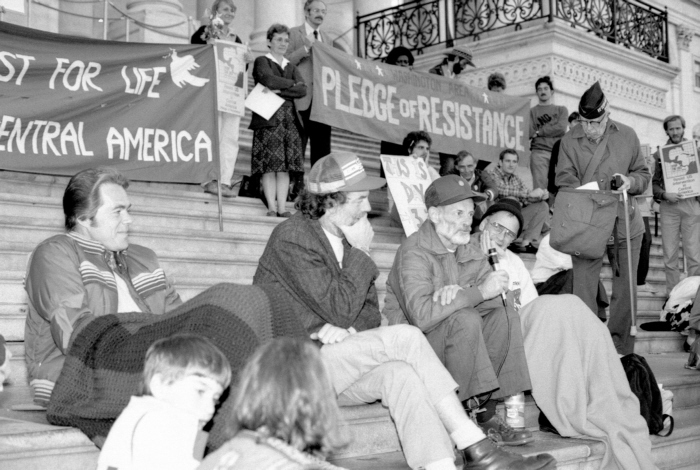 This course could include such figures as Bayard Rustin and Grace Lee Boggs. But even more to the point, it could zoom in on the often unsung women and men who form the backbone of nonviolent change, like those who never miss a meeting or who quietly go about the business behind the scenes of energizing one movement after another. Duncan Murphy, who died this week at the age of 92, was one of these ordinary, extraordinary human beings. He would be a good focus for this kind of class. I met Duncan in 1987 when he joined Nuremberg Action, a group that was planning a 40-day fast beginning on September 1 of that year to protest arms shipments from Concord Naval Weapons Station, east of San Francisco, to Central America. As I have previously chronicled on this site, the U.S. Navy munitions train that Duncan and others sought to blockade on the fast’s first day barreled through the group, leaving Vietnam veteran Brian Willson maimed for life. Everyone else managed to get off the track in time, including Duncan, but only barely — he grabbed hold of the train’s cowcatcher and swung away from the 250,000 pound locomotive to safety. Duncan’s decision to carry on that September morning was a logical extension of an action that he and Brian (and Charlie Liteky and George Mizo) had embarked on a year earlier. The Veterans Fast for Life in Central America was an open-ended, water-only fast that the four U.S. vets conducted on the steps of the U.S. Capitol that began on September 1, 1986, and ended 47 days later on October 17 after garnering widespread congressional support and sparking more than 500 demonstrations for peace across the United States. I was looking through a book that had photographs of trench warfare of the First World War, and at that time it made no sense at all … I think kids have better sensitivity than adults sometimes. Here’s craziness, why? For what? What do you do that for? That stuck with me. I worked with survivors of the Nazi atrocities after the army unit I was with liberated Belsen … The Jews, Gypsies and other prisoners there told me the same kinds of stories I’ve heard from survivors of Contra atrocities during my trips to Nicaragua. For over 40 years, I have done everything I possibly could to prevent the horrors of the Holocaust from recurring, only to be betrayed by high officials in this country. Two-thirds of the American people were opposed to aid for the Contras [the U.S.-backed Nicaraguan counter-revolutionaries], but Congress went ahead and gave them $100 million anyway! So now I’m willing to lump together whatever years are left to me and give them all in one short time to activate the ending of the U.S. war in Central America. Duncan kept his word. For the rest of his life he worked for peace, including participating in protests at the School of the Americas at Fort Benning, Georgia. Duncan Murphy’s quite lively, lean and agile and energetic as a squirrel. He’s compact, taut and wiry, a bit gnarled, but honest and true as a seasoned oak burl. His hair’s gray and a little thin. He wears a mustache neatly trimmed, and his face has the good lines you earn during a life of useful work. Duncan’s useful work went beyond topping trees. Keeping his needs simple and living a largely nomadic life for the last few decades, Duncan engaged in the work of conscience in a world writhing with violence and injustice: spending oneself freely to sound the alarm and to offer an example of what every one of us can do, if we are willing. Thank you, Duncan, for your exquisite contribution to Nonviolent Change 101. Duncan Murphy’s life will be celebrated on September 1, 2012 as part of the gathering at Concord Naval Weapons Station (Concord, California) marking the 25th anniversary of the Nuremberg Action where Brian Willson was run down by a U.S. Navy munitions train. The details of Duncan’s remarkable feats on September 1, 1987, reveal an extraordinary act of courage and finesse. This essay correctly identified that Duncan “grabbed hold of the train’s cowcatcher and swung away from the 250,000 pound locomotive to safety.” But it misses the drama of just how he grabbed the cowcatcher, and how he swung away. In truth he grabbed the railing mounted to a platform built above the cowcatcher, a railing 10 feet above the ground upon which Duncan was standing between the rails. He leaped in a perfectly timed vertical jump straight up enabling him to grab the railing that the two train “spotters” who were standing on that platform were holding with their own hands. The FBI determined the train accelerating at more than three times its legal speed limit – 17 mph – at the moment the 67 year-pld Duncan jumped. Just as amazing, he did not swing away, but in an equally finessed jump, he leaped off the accelerating train, likely by this time to be speeding at 18 or 20 mph, to land on the ground beside the racing locomotive, running to the rear of the train awaiting the last boxcar to clear over my limp body lying between the rails. He was the first person to my body, just ahead of Holley Rauen, and the two of them began immediate provision of first aid as the Navy Ambulance arrived, then left, saying my body was not technically lying on Navy property. An interesting detail is that when Duncan jumped straight up as the train was bearing down, he leaped out of one of his moccasin shoes which appears in the photos lying just to the left of the right rail. That is the approximate spot, therefore, where I was hit. Photos also show that as Duncan was running to the rear of the train trying to get to my body, he was carrying his other moccasin in his hand. Apparently it came off when he hit the ground, and he quickly retrieved it in his hand as he raced to the rear of the train. Thank you, Brian, for providing a more complete picture of Duncan’s spirit embodied amid the horrific events of September 1, 1987. He–and you–illuminate for all of us a way of life committed to nonviolent change for the well-being of all. As you have often said, it is up to each one of us to find our own tracks–and to take a stand there for justice and peace. Thanks so much for writing this tribute to Duncan. Thank you so much, Ken, for this excellent and much needed tribute to our wonderful friend Duncan Murphy. Did you know that Duncan self-published a book of his own life and times? It is quite remarkable – almost painfully honest – and includes many photos. I don’t believe this book has been distributed very widely. But it is a real treasure. I saw a box of them when I visited him last year in his room in Santa Cruz. I also have a copy. He was so grateful when I read it and gave him some positive feedback. Duncan Murphy, goodbye for now, dear friend. You will always be with us, leading by example, and goading us on to do more! I never met Duncan Murphy, but had a conversation over the phone with him about a year ago. I was hoping to meet him, as I plan on being in Concord, California on September 1st. The more I think of Duncan, the more I realize I really knew him, because of the passion I have for human justice, and the overwhelming desire to bear witness about my own experiences of being a medic in Vietnam, and how that war turned me into a global citizen. I am Duncan Murphy, and he is me. There is no separation between moral freedom fighters. If I could say one thing to Duncan, it would be very simple: When you take your last breath, your eyes open to a new world. Yes, Duncan’s painfully honest memoir, “A Journey Through Time and Space (guided by the Traveler within,” was self-published in 2001. I have a copy and will be bringing it with me to the tracks on September 1, reading a small passage from it for our 25th anniversary commemoration. As some of you know, I actually met Duncan in 1951 when I was 10 years-old, and Duncan, at 31, drove a Shiloh Bakery delivery truck delivering fresh baked goods to our home every week in a small town in Chautauqua County, NY, where my mother had a standing order. Thirty-five years later we met at a solidarity meeting in Washington, DC where I thought I recognized that delivery man sitting in the circle. Sure enough, it was Duncan, the former Shiloh delivery man. Within a few months we were fasting together with George Mizo and Charlie Liteky on the steps of the US Capitol building protesting Raygun’s terrorist policies in Central America.